ETH researchers led by Professor Martin Fussenegger have developed the first gene network to be operated via brainwaves. Depending on the user’s thoughts, it can produce various amounts of a desired molecule. The inspiration behind the project was a game that picks up brainwaves in order to guide a ball through an obstacle course. It sounds like something from the scene in Star Wars where Master Yoda instructs the young Luke Skywalker to use the force to release his stricken X-Wing from the swamp: Marc Folcher and other researchers from the group led by Martin Fussenegger, Professor of Biotechnology and Bioengineering at the Department of Biosystems (D-BSSE) in Basel, have developed a novel gene regulation method that enables thought-specific brainwaves to control the conversion of genes into proteins – called gene expression in technical terms. “For the first time, we have been able to tap into human brainwaves, transfer them wirelessly to a gene network and regulate the expression of a gene depending on the type of thought. Being able to control gene expression via the power of thought is a dream that we’ve been chasing for over a decade,” says Fussenegger. A source of inspiration for the new thought-controlled gene regulation system was the game Mindflex, where the player wears a special headset with a sensor on the forehead that records brainwaves. The registered electroencephalogram (EEG) is then transferred into the playing environment. The EEG controls a fan that enables a small ball to be thought-guided through an obstacle course. The system, which the Basel-based bioengineers recently presented in the journal Nature Communications, also makes use of an EEG headset. The recorded brainwaves are analysed and wirelessly transmitted via Bluetooth to a controller, which in turn controls a field generator that generates an electromagnetic field; this supplies an implant with an induction current. 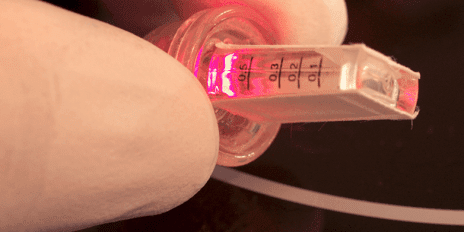 A light then literally goes on in the implant: an integrated LED lamp that emits light in the near-infrared range turns on and illuminates a culture chamber containing genetically modified cells. When the near-infrared light illuminates the cells, they start to produce the desired protein. April 16, 2019 - Age-related Changes in TTR Gene Expression May Explain Disease Differences Within Families, Study Suggests FAP News TodayFAP disease variability among family members may be linked to the expression of different copies of the TTR gene during the aging process, a study suggests. March 29, 2019 - Breast Cancer Gene Expression Altered by Walnut Consumption Genetic Engineering & Biotechnology NewsNew research from Marshall University links walnut consumption as a contributing factor that could suppress growth and survival of breast cancers.